GERMAN MILITARY FORCES IN DREADFUL CONDITION–WHY? Germany, the industrial powerhouse of Europe, has let its military forces wither to the point that Germany has no meaningful military force at this time with which to defend itself. It is scarcely possible to describe how weak Germany really is militarily, but I will offer readers some links that do make that point clear. How many front-line warplanes do you think Germany has ready for combat? 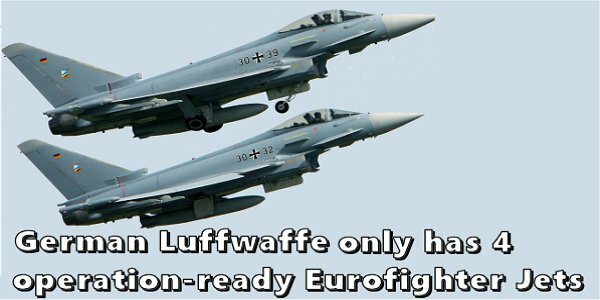 The German air force, on paper, has 128 first-line Euro fighter jets in its air force and had pledged to NATO that at least 82 will be available for service in a crisis (first link). However, Germany reportedly now has only a grand total of ….get ready…wait for it...four fighter jets ready for active deployment. That’s right –just four. That means if a full-fledged war broke out, the German air force might last perhaps five minutes. With all of Germany’s industrial and engineering know-how, Germany could have its warplanes ready for service quickly if it chose to do so. It gets worse. The same link reports that at the end of 2017, all of Germany’s submarines were in dry-dock for repairs. That means that the German navy had no subs available to defend the nation if a war had broken out. The link adds that at times Germany’s air force has none of its military transport airplanes available for duty. The first link cites a report given within the Germany parliament that is “damning” in its appraisal of the condition of Germany’s military forces. Obviously, the government of Chancellor Merkel is deliberately making budgetary and policy decisions that have severely weakened Germany’s military forces. Why? Is she utterly incompetent to lead? Does she have a private agenda to disarm Germany without stating so openly? Or does she have a secret agenda that she has not revealed? Merkel is a smart person, so she has to have some reason. First, let’s examine additional chilling statistics about the unreadiness of Germany and the rest of the western world to defend itself. The second link, third link and fourth link report that only about half of German recruits are “suitable” for militarily service, and they also reveal the entire array of Germany’s military equipment is in pathetic condition. Most shockingly, these reports include the revelation that only a low percentage of the new equipment delivered to the Germany military actually works. Only about 38% of German military equipment is functional. Some of this information is from the Russian media, so Russia, the primary rival to NATO, is very aware that Germany has woefully neglected its own self-defense abilities. It also confirms that US President, Donald Trump, was “spot on” when he criticized NATO nations for neglecting their national defenses and simply relying on the USA to protect them. Some nations within NATO did get the message delivered by Trump. NATO’s Secretary, Jens Stoltenberg, recently stated that Trump’s prodding of NATO nations to increase their defensive forces has resulted in NATO nations boosting their military spending by an extra $100 billion (fifth link). However, it is clear that Germany has not gotten the message. It is still neglecting to pull its share of the load within the NATO alliance. If Russia attacked Europe soon, Germany is apparently relying on Poland’s armed forces to defend it from invading Russian tank divisions. Poland is a NATO nation that is seriously beefing up its military power and it is one of the few nations within NATO that is meeting its spending obligation. I cannot help but make an ironic historical observation. We are all familiar with many historical documentaries that have World War II in Europe beginning with Germany’s invasion of Poland. Poland didn’t last long. However, if Poland and Germany actually experienced a war between their nations in the modern world, Poland is so much stronger than Germany that Germany would likely have to capitulate within hours. Thankfully for the Germans, Poland is a German ally within NATO. So as not to just pick on Germany, let’s examine the readiness of some other primary NATO allies. I’ve posted about the British military forces before and they have their problems too, but they are making some major efforts to develop a serious military force. Their two new aircraft carriers (one of which is in the process of going into active service and its sister ship is still in construction) will be among the largest in the modern world and will be the most powerful warships ever made for the British Navy (sixth link). However, the seventh link reports that half the British population is unable to pass an army selection exam, and the eighth link adds that half the Americans in their 20s are unfit for military service. The unreadiness for military service of fighting-age populations is likely a condition affecting the entire world, but a persistent inability to make or maintain military equipment in working condition seems to be a uniquely German failing. In many nations, if their military forces had been allowed to atrophy as bad as in modern Germany, the national government would have already fallen. While Merkel has been weakened in her position over the last year, she is still in office despite her blatant neglect of Germany national security. Is there a deeper plan? In recent posts, I have noted Merkel’s call for national governments to surrender their sovereignties to international entities and her call for governments to ignore their citizens’ wishes in important decisions. Apart from its obviously tyrannical nature, her statements may give an insight into her long-term strategy. If the EU member nations either choose to (or are coerced) into surrendering their sovereignties to the globalist EU, the EU (dominated as it is by Germany) would inevitably take over the command the military forces of all member EU nations. Merkel and her close ally, Macron of France, have been calling for an EU army. If the EU ever seizes control of the EU national militaries of its member states, the EU would then take control of France’s nuclear forces and the German-dominated EU would become a nuclear power. Maybe that is one reason why Merkel and the EU leaders are fighting so hard to keep de-facto control of the United Kingdom in the Brexit process: The EU may have hoped to eventually take over the British nuclear forces as well as the French nuclear forces. Is this why Germany is not investing in its own military forces? Does it intend to eventually control the military forces of all Europe via a process of assimilating them via the EU’s suppression of national sovereignties? The above concerns are matters worth keeping in mind as future geopolitical developments unfold. Many Christians who follow prophecy expect the “beast” and “false prophet” of the book of Revelation to originate in Europe. As the EU consolidates its power over European nations, that is a plausible outcome. However, the EU is itself beset by many internal fractures that are endangering the globalist plans to make the EU an “empire” or a “United States of Europe.” As readers of my blog know, I see the EU as one of the constituent global parts of the current (Babylon the Great) world political/financial system which has held sway over the nations for a long time. If this is a correct identification, then the EU’s leaders and the globalists are prophesied to be on the losing side of a titanic global struggle for power. For more information about the Bible’s teachings on this topic, please see my free articles, Is Babylon the Great about to Fall…Ushering in a New Beast System? and Are We Living in the Biblical Latter Days? My thanks to a reader for sending me one of these links.